Inspiration comes to Alex in many ways, for example her embellished record sleeves dating to the 1960s and 70s. In a series titled “Vinyl” she applies rhinestones, gold foil, glitter and other “glam” objects as part of her collage work. 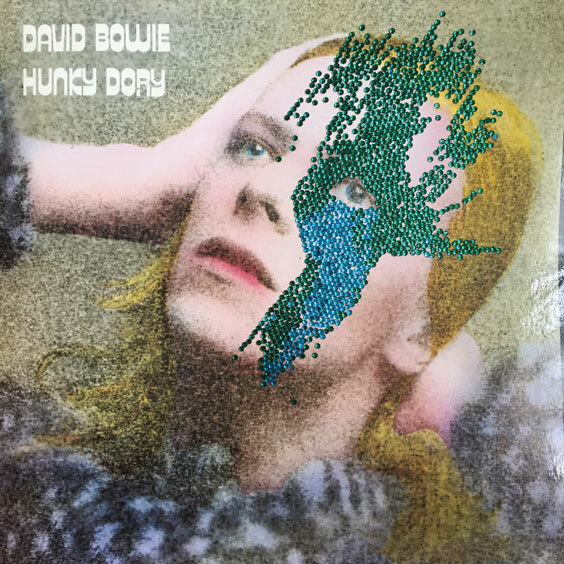 In “Bowie Pinups” she has fashioned gold masks for David Bowie and supermodel, Twiggy who were featured on the 1973 album cover. Another, Herb Alpert’s Tijuana Brass 1965 popular album and cover, features model Dolores Erickson covered in shaving cream. Alex has applied rhinestones all over the image, highlighting Ms. Erickson’s eyes. Alex calls this a “fetish-zing” of the covers that harks back to the decades just before her birth. It is her desire to celebrate the decades when her parents were young. 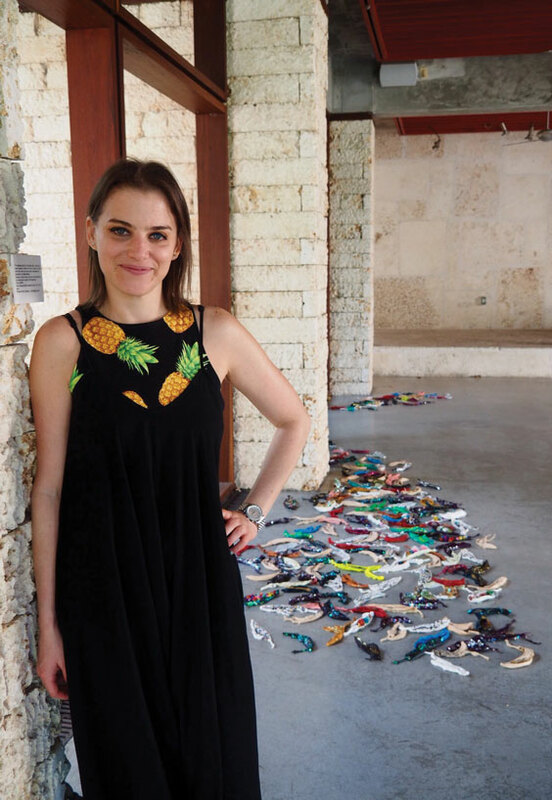 Alex’s educational background includes studies abroad in Spain and Italy, an undergraduate degree from Loyola, and a Master’s in Fine Art from Hunter College, New York. While attending Hunter in an arts program that is no longer offered, Alex had the opportunity to work in a very large studio. Here she painted and assembled her thesis work, “Don’t Go Chasing Waterfalls.” Measuring 16’ x 45’, the piece is a mixed media installation with paint, canvas, glitter, and mirrored confetti that flows onto the floor via loose canvas that ripples thanks to a fan installed behind the piece. The fan causes the cloth to move and constantly reposition the patterns and reflections. Her work on canvas uses a technique of mark-making and staining onto which she pours paint, letting it pool or run to create its own shape. On her canvases Alex adds to the painting glitter, found objects, and in some cases, food. She likes to bring in those things that remind her of family, too. In a recent painting she laid the wet canvas on the ground of her parents’ Kendall home. Two overly-curious resident peacocks casually walked over the surface of the painting, rearranging the original composition. Alex welcomed their involvement. 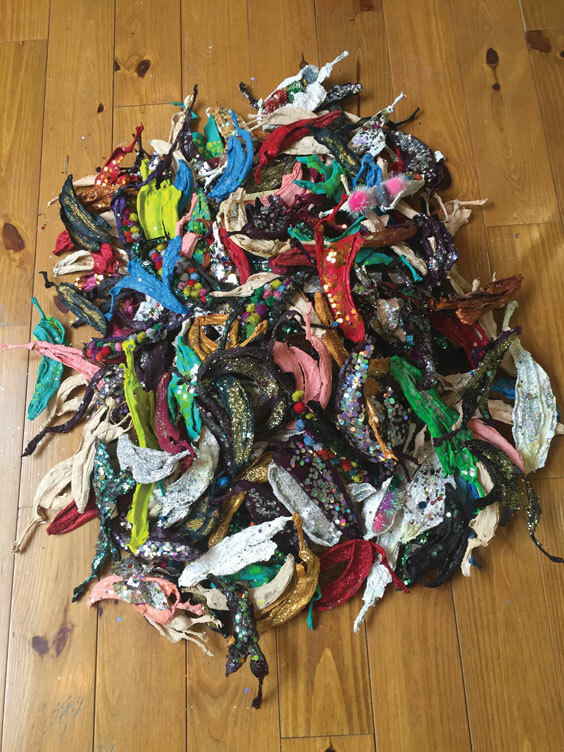 Recently, she participated in the The Miami House Show at the Kampong Botanical Gardens with her installation of 200 embellished banana peels done to remind us of the aging process and the impermanence of life. Alex launched a radio show called “Sunday Painter.” This is a series of podcasts that explores the connection between artists and their inspirations. Broadcast on KPISSFM from a modified shipping container in Bushwick, the show features New York-based artists. Alex is a Miami native from a Cuban-American family. She was recently accepted into Fountainhead Studios in Little River where she will have her studio. The artist has shown extensively in New York and Miami and has been the subject of many reviews and articles in newspapers and magazines. For more information, visit alexnunez.net to see samples of her art, listen to podcasts of her radio show, and follow her next artistic adventures from Miami.